I have to say Easter is one of my favorite holidays. Of course there is the important religious aspect, but even if you are not particularly religious I feel that Easter can still be a time for taking a moment to pause and reflect on the symbolism of new beginnings, hope and miracles. I’m also all about the cultural aspect of Easter celebrations and the start of spring along with bunnies, flowers, and baby chicks. And there are so many fun family Easter events and activities to partake in, which is of course right up my alley because I love celebrating every holiday in a big way and making it fun and memorable for my kids. Color Easter Eggs: We always spend an afternoon coloring Easter eggs – because it isn’t Easter without it! We usually just use simple store kits, but they do have some really pretty options these days (I really love the metallic ones). You can also just use food coloring as well. And these are so “extra” but I really want these darling aprons for the kids! Make Easter Cookies: We make and decorate frosted sugar cookies for several holidays throughout the year. It has become tradition to make our themed cookies and we always have so much fun sitting down together as a family and decorating them. Visit the Easter Bunny for Pictures: I always joke that the mall Easter bunny looks a little creepy and strange, but it has become a fun tradition to dress the boys in cute spring shirts and go see the bunny for photos. Go on a Easter Egg Hunt: We always attend at least one community egg hunt in the days leading up to Easter (last year we went to an evening glow in the dark one which was really fun! ), as well as have our own small egg hunt at home on Easter. When we first started having our own little egg hunt, I didn’t think the kids would be super excited about it and did it more as an activity to keep them busy during the day. However it has become a must do as Cole will literally start talking about it weeks before the holiday and making sure we will have one. And on Easter he will ask all morning long about how soon we can have our egg hunt – so needless to say it has been a hit. At our house the Easter bunny brings baskets in the morning, and mom and dad set up the egg hunt in the afternoon. I also spotted this Easter Egg Hunt Sign Kit the other day and it is soooo cute. I really want to get it! Easter Baskets: Of course Easter isn’t complete without Easter baskets! The bunny always drops them off at our house very early, so the kid’s baskets are waiting for them first thing in the morning! With the weather warming up, I like having things in their baskets that get them outside as well as practical things they can use into summer. This year I found so many ridiculously adorable things in the Target $5 and under section! Things like bubbles, sidewalk chalk, kites, gardening supplies, pool toys/swimsuits, and a few treats are perfect basket fillers. A fun breakfast: I like setting up a cute, festive tablescape and adding a little craft or something the kids can work on at the table. There are so many cute Easter breakfast ideas on Pinterest, but if you are strapped for time (or don’t want to spend all day in the kitchen if you are making Easter dinner too), a make ahead breakfast casserole you can simply pop in the oven is a great option. Also just decorating a simple bowl of oatmeal or making a bunny pancake is another fun option. I also like this springtime waffle bar idea or even just dyeing pancakes pastel colors would be cute! Last year I served these Peeps fruit skewers at dinner, but they would be cute at breakfast too. Watch a fun show: To get the kids to settle down after the morning excitement & pass the time until dinner, we like watching a spring or Easter themed movie or show. My boys just recently watched Watership Down on Netflix (they loved it!) and this would be a great Easter Day watch. A Charlie Brown Easter is a classic, and we also really enjoyed Hop last year! This year I’m thinking that we may watch Peter Rabbit. Dinner as a family: We used to go out for brunch, but after several years of feeling that it was a bit of a hassle trying to get dressed up and drag the kids out, we started staying home and we have found it to be a lot more fun and relaxing. I always cook a big meal (I personally love a traditional ham!) and sitting down to dinner together with my family. While we aren’t regular churchgoers, we still observe the religious aspect of the holiday and talk to the kids about why we celebrate Easter. My husbands father’s family was Jewish, so we also like to talk about Passover so they can understand a bit about their family background and beliefs! I always use my mother-in-law’s vintage Pottery Barn spring plates – with the bunnies and flowers they are just perfect, and of course sentimental as well. Wishing you and yours a blessed and happy Easter! I grew up in a very small, predominantly Irish Catholic community, so as you can imagine St. Patricks day was a BIG deal. The weekend of festivities was one of the big highlights of the year for the 1,500 residents in our town, and as a young child I remember being so excited about all of the fun activities to look forward to. We had a parade, sheepdog trials, lots of good food, and various performances. I remember one year when I was about 8 or 9, I was part of a square dance group where we got to dress up and perform (I remember being super excited about that big green twirly skirt). A few weeks before the big day, Cole will start thinking about the design and start building his Leprechaun Trap. He gets so excited at the prospect of possibly catching one and it is a fun craft activity for a lazy weekend or afternoon. Pinterest has tons of cute ideas for creating one (also lots of ideas here)! We were really excited this year, so we’ve already finished ours (pictured!) and we are hoping this is the year we finally catch one! Having Leprechauns make a little mischief at your house can be a fun St Patrick’s surprise too! We haven’t been successful in catching a Leprechaun yet, but each year those mischievous little men will leave the kids a set of clues to go find their own pot of gold (chocolate coins)! Of course you can create your own clues, but Pinterest makes it simple with tons of free printable ones as well. Green pancakes and milk are such a fun way to start the day but you can also make it super, duper simple and have a bowl of lucky charms & some green fruit. I like to set the table with some fun touches like a St Patrick’s Day placemat and napkins/straws. One of my favorite traditional Irish meals is Cottage Pie (basically it is Shepard’s Pie but with beef instead of lamb). I make this nearly every year for the holiday and it is a delicious comfort food dish. I think it would also be fun to make traditional soda bread and have the kids help as it is so simple, and also a fun educational dish in teaching kids about the origin of it. There are so many fun options for green food on Pinterest, especially desserts! (Tons of food ideas here) We also like making and decorating shamrock shaped sugar cookies with green frosting and “gold” sprinkles. 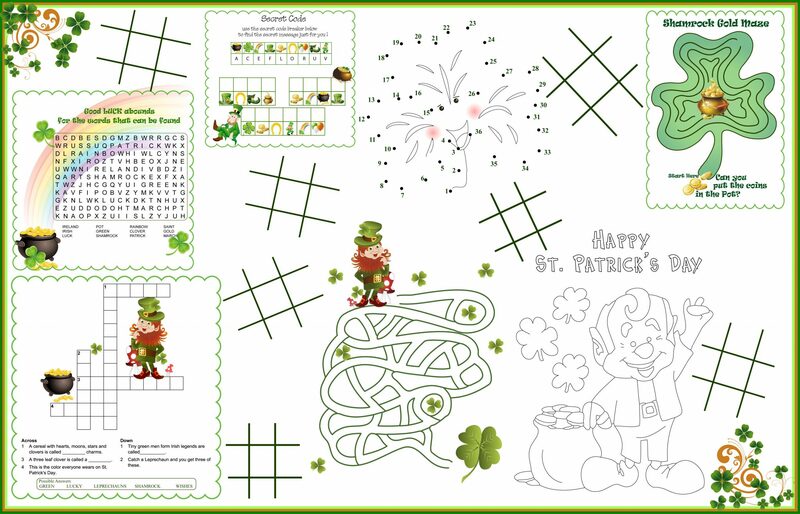 Activity sheets and/or reading a St Patrick’s day book are fun activities that will also teach kids a bit about St. Patrick’s Day and Ireland. I found some free educational and activity sheets for my kids here. And if you are lucky, your local community may have some fun events or a parade to attend as well! The easiest way to celebrate, and of course necessary if you don’t want to get pinched! Ahh Trader Joe’s…one of my favorite places to go shopping (along with Costco and Target!). So many great things at even better prices. I have a few go-tos I always grab on a trip to Trader Joe’s, as well as a few sections I always browse. Today I’m sharing some of my favorites and some new products I’m loving! Gummy Vitamins – Reasonably priced multivitamin for kids. I often grab myself a multivitamin there for myself as well. Rosé Vinaigrette – I love a good vinaigrette so I was super excited to find this one! I haven’t tried it yet, but it looks really promising. Cookie Cocoa Swirl – My kids are big bread/toast eaters and they aren’t huge fans of peanut butter or Nutella. This is a fun alternative. Chia Seeds – I love adding these to smoothies (my kids love them!) and these are very well priced. Gorilla Munch cereal – A classic that my kids absolutely love. Roasted Cocoa Nibs – These are a great topping for oatmeal or smoothie bowls. They add some chocolate flavor without the guilt. Reduced Guilt Pita Chips – I love pita chips and these are a delicious reduced calorie version that tastes the same as the regular ones! Creamed Honey – Another delicious bread/toast topping that my kids absolutely love. Organic Chicken Broth – TJs broth is delicious and well priced. I make soups often so I like to keep a few on hand. Seasonal Treats – I grabbed these chocolate covered heart cookies for my kids a few weeks back for Valentines. They always have fun seasonal snacks! Vanilla Bean Syrup – My kids absolutely love this vanilla bean infused syrup. Rainbow of Honey – We add honey to smoothies and tea, and this rainbow of honey kit is not only good but it looks pretty sitting on the counter. Cheeses – Trader Joe’s always has the best cheeses. Not pictured but I especially love their Burrata and also their Truffle Cheese. And I love adding feta to salads and the Mediterranean herb is especially good. Skillet Chocolate Chip Cookie – For nights when you want a fresh baked cookie but don’t want to make it from scratch – just toss this one in the oven! Pizza ingredients – I love homemade pizza dough – but Trader Joe’s does have really good refrigerated dough. I also like their pepperoni, shredded mozzarella & pizza sauce. Green Goddess Dressing – I bought this after hearing a lot of good things about it. I’ve seen tons of recipes/uses for it on Pinterest and it is low calorie! Pastry Pups – My kids absolutely love these. These are great for a lazy Sunday lunch or a play date. They are also nitrate free. Hummus – I’m the only one in my house who really likes hummus – but this makes for a great snack with pita chips & a little feta. Vegetable Samosas – These aren’t quite as good as the delicious Indian restaurant here we like to go to – but these are a pretty solid substitute. Tzatziki – TJs has so many good sauces! We had gyros recently and this is so good & easier than making from scratch on a busy weeknight. Jasmine Rice – I love their frozen rice for busy weeknights. So simple to prepare! Their brown rice is very good too. Not pictured but my kids absolutely love their frozen croissants & they make a delicious Sunday morning breakfast. Sparkling Berry Lemonade – These are fun special occasion or picnic drinks! They have a few other flavors too. Breads – I like checking out the various breads they have when I’m there. I like their pita bread & recently saw a cinnamon bread there that I want to try for French toast. Baking ingredients – I really like their chocolate chips and also their seasonings! Hand Soap – I always make sure to check out their hand soap section when I’m there. I got the cutest winter White Pine soap/lotion set around Christmas for my bathroom. I think this grapefruit one actually looks cute sitting on my kitchen counter too! Candle – Their $3.99 soy candles are a steal & they always have new scents! The minute my kids walk in the door after school every day, they immediately ask me for a snack. It’s important for me to make this snack healthy and although I’m pretty fortunate that my kids love fruits and vegetables, they don’t exactly love salads and dark leafy greens. However they love this smoothie and request it as their after school snack several times a week! Optional: I also like to add 1 tbsp chia seeds for some healthy fat and/or 1/2 cup berries should I have them on hand. You could also add protein powder to make this a meal replacement! If you wanted to make this into a bowl rather than a smoothie, reduce the liquid content to make it thicker and top with toppings such as sliced banana, berries, shredded coconut, chia seeds, granola, and a drizzle of honey. Valentine’s Day is a week away, and today I’m sharing how we choose to celebrate the day! My husband and I don’t celebrate Valentine’s Day as a couple (I feel like it’s a bit cheesy) but I do admit I kind of enjoy embracing the kitsch and celebrating it as a family. I tend to go a bit overboard on celebrating most holidays, but I like to keep Valentines to a minimum with a fun homemade dinner for the family & a simple gift for each of the kids. Heart shaped pizza is a classic Valentines Day dinner that is so simple to make with refrigerated dough! (I buy it from Trader Joe’s) The hubs and I love a good bbq chicken pizza, and for the kids you can amp up the valentines theme with some heart shaped pepperoni! Heart shaped pasta noodles, or even pink-dyed noodles would be cute as well. For dessert, I love making a chocolate fondue (pot and recipe) with lots of different dipping items like berries (especially strawberries! ), marshmallows, and mini-brownies and/or cookies. How do you celebrate Valentine’s Day?! A bit of a backstory; after 3 years at our last home, we decided to seriously consider a move early last year. While we really liked our last home, we never loved the location as it was several miles out of town & a bit of a drive for everything we wanted to do. It was also not zoned for the greatest elementary school so we had Cole enrolled in private school – which really had become a nightmare situation for so many reasons. We started looking around and had found a community we really loved that was up in the foothills outside of Boise…but we just couldn’t pull the trigger because we were worried about being in the same situation with feeling a bit too isolated. Then we came across a brand new community in a location that couldn’t be more perfect for us. Minutes from downtown, right next to the Boise river, hiking in the foothills right down the street, and in a 10/10 ranked K-12 public school district. Although we were very familiar with the builder, the house wasn’t even built & the finishes were all pre-selected so we would not be able to make any changes. We also had to try to decipher blueprints and try to determine if we even liked the floor plan! However with how hot the housing market was (and still is!) in Boise, we knew we had to make a quick decision. We submitted our offer in June, the house went up and was completed by mid August, and we moved in a week before Cole started his new school. I can’t even tell you how stressful it was, but now that we are here, I’m so thankful we took the leap and absolutely love our new home, neighborhood and school! Evan even started preschool at a little school that is in our neighborhood and he absolutely loves it. There’s shops and restaurants we can walk to, a new huge park being built across the street, and we are in biking distance of downtown. It really couldn’t be more perfect for us! All of my display pieces are several years old. The necklace bust display, bracelet holder, and mirror were all purchased at Target. The ceramic tray was from J Crew, the small silver ring cup was from Target, and the silver tray was from Home Goods. Since they are all long sold out, here are some similar options! Replacing the light fixture to a fun chandelier is definitely on my to-do list this year as well. But overall I’m really pleased with how the space has turned out and it has been very functional for me. If you are looking to give your closet a refresh, or maximize a smaller space, I hope this was helpful! Thanks so much for stopping by! I’ve been meaning to post this recipe for awhile as I’ve been making this soup several times a month all fall and winter! This week seemed a fitting time to share as it was the perfect meal for our first night back to school and our busy routine yesterday. I had found a few vegetable beef soup recipes online a few months back that just didn’t quite suit my tastes or turn out quite correctly, so I spent some time perfecting this soup and it has become a family favorite! It is so simple to make and is also ready in minutes, which is perfect for busy weeknights. Turn Instant Pot to Sauté; add oil and heat until hot. Add onion and sauté for approximately 3-4 minutes until translucent. Add garlic and sauté for 1-2 minutes more. Add ground beef and sauté until beef is browned through. Drain and turn instant pot off. Add can of stewed tomatoes with liquid and break into small pieces. Add tomato paste, oregano, cayenne, crushed red pepper, salt, and pepper. Stir all ingredients together. Add carrots and potatoes, then add broth. Stir to combine all ingredients. Place lid on instant pot and close vent (seal). Press the manual button and set the timer for 4 minutes. Once the timer beeps, do a manual release of pressure by turning the seal to vent. Once the pressure is released, remove the lid and enjoy! *Note: This could also be made in a crockpot or stovetop if you don’t have an Instant Pot – although I use mine a ton and think they are absolutely worth the investment! This soup does have a little heat, so if you don’t care for that you can reduce the amount of cayenne or crushed red pepper (or exclude!). What is so great about this soup is you can really customize it to suit your tastes. You could use ground turkey or chicken, add other vegetables you like (such as corn or celery), and use your broth of choice should you prefer beef or vegetable. This soup also manages to be low in calories, and still very filling!